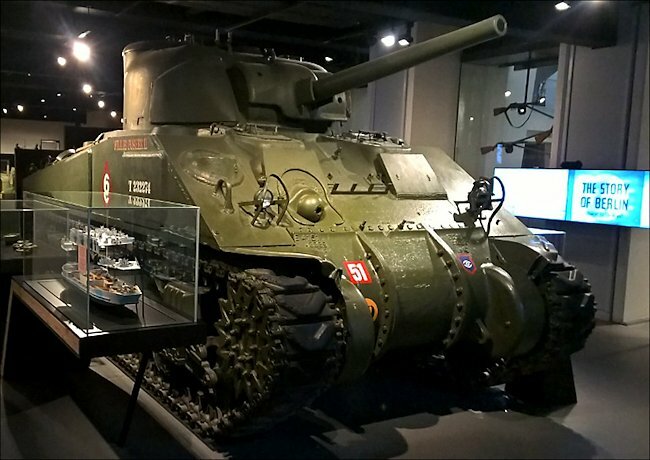 Sherman M4A4 British Medium Tank at the Imperial War Museum London. 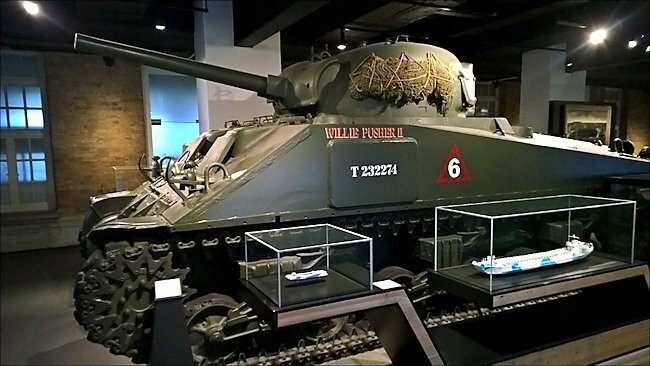 The main difference between a Sherman M4A4 compared with other variants of the Sherman tank is that it had a lengthened welded hull which caused a larger spacing between the bogies than on all the other Sherman versions. The front of hull was a 3-piece differential housing rather than being a one piece unit. The additional welded spaced armour plates in front of the driver and co-driver's positions are 1 1/2 inches thick. There are normally large Lifting rings attached to the front of the hull on rectangular bases. and was fitted with a Petrol Chrysler Multibank A57 5x6 cylinder inline engine. It was fitted with the 75mm gun. Records show that 7,499 M4A4 Sherman tanks were produced by Chrysler at the Detroit Tank Arsenal between July 1942 and November 1943. The M4A4 was used by British and Commonwealth forces as well as with the Free French, Chinese Army and Polish Divisions after D-Day but was not used operationally by the U.S. Army or U.S.M.C during WWII although some were used for training Stateside. 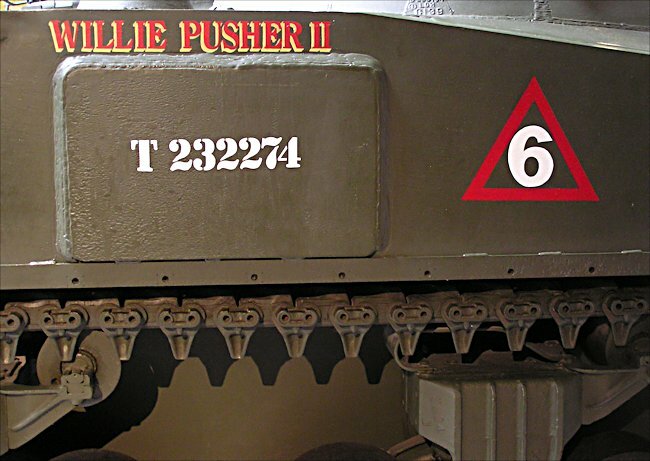 The following units were know to use Sherman M4A4 tanks during the invasion of Europe in 1944 there were many more; No.2 Squadron, 2nd Irish Guards, Guards Armoured Division: 29th Armoured Brigade HQ, 11th Armoured Division and the No.2 Squadron, 2nd Armoured Regiment, 10th Armoured Cavalry Brigade, 1st Polish Armoured Division. Notice the two additional armoured plates welded in front of the drivers position on this Sherman Tank. This spaced armour is 1 1/2 inches thick. In September 1944, after months of vicious fighting, tanks from the American 3rd Armored division reached the border of Nazi Germany confident that the war would soon be over. The Allies did believe that the war was going to be over by Christmas. Unfortunately that was not going to happen. German forces put up a fierce defence. They were now fighting for their home land. Facing battle hardened opponents the Allies soon learnt that invading Germany was going to be a long hard and bloody campaign. The attack into Germany was to be spearheaded by the US 3rd Armoured Division comprised mainly of Sherman tanks and M10 Wolverine tank destroyers. The first obstacle they would face was a series of fortifications known as the Siegfried Line or the west wall, that the Germans had built along the border. There were a number of bunkers, tank traps, dragon’s teeth anti-tank barriers and gun emplacements that were designed to turn different areas into kill zones. Although it looked very formidable and impressive, advanced scouts from the 3rd Armoured Division discovered weak spots in the line. The American engineers came up with a very simple way to get past the obstacles. They fitted a very large bulldozer blade to the front of a Sherman tank and pushed earth over the concrete dragon’s teeth to form a small mound. When there was enough compacted soil the rest of the tanks just simply drove over the top of the once un-crossable line. The US Army was now in Germany. 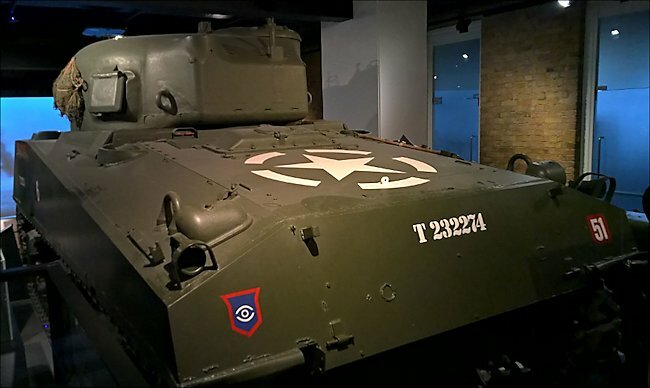 These are the markings for the Guards Armoured Division Sherman M4A4 British Medium Tanks. It saw action in Normandy and the rest of North west Europe during 1944-45. To finish the war the Americans had assembled a massive invasion force from the US 1st Army, comprising of 100,000 combat soldiers, hundreds of artillery guns and more than 1200 tanks, of which 850 were Sherman tanks. 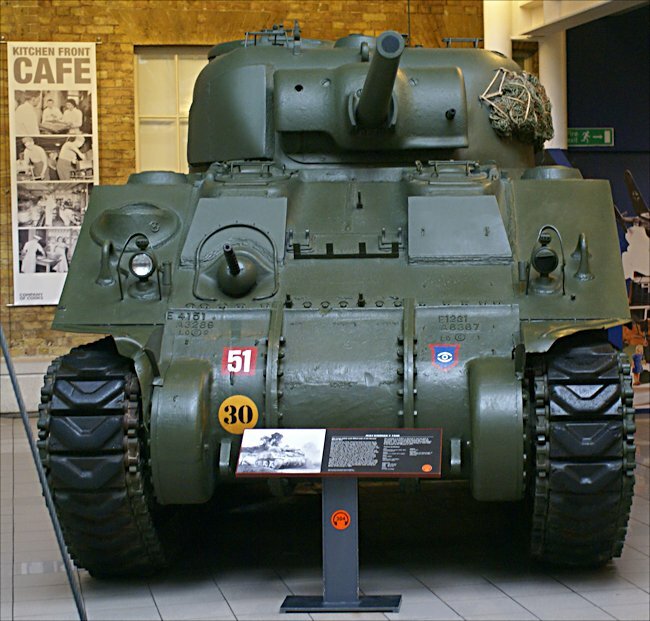 The M4A1 version had a short barreled low velocity 75mm gun with an effective range of only 800 metres. 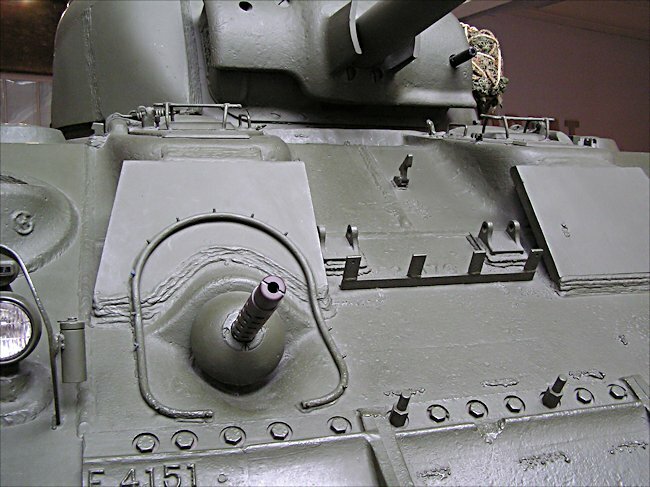 With only 51mm of frontal armour it was very vulnerable to most German high velocity weapons. All through their training the US tank crews were impressed with the new Sherman Tanks they had been given to use. It was fast, mobile and they felt safe in their 32 tonnes of steel. They were in for a horrible shock when they went into battle for the first time against much better and more capable German tanks. The 3rd Armoured Division were order to advance north west along the Aachen corridor just north east of the Hurtgen forest towards the Roer River. Cpl. Walter Stitt, a tanker of the 3rd Armoured Division described his experiences, like so many others, of entering his first German town. "Two platoons of E company, 3rd Armoured Division approached the town and split into two separate forces. It was only a small town with one main road and house on each side. Behind one row of houses there was a hill. Behind the other row of houses there was an open field an in the distance there was a slag pile from the nearby coal mine. Four Sherman Tanks went on the outside of those house. The four tanks that I was with went on the inside along the road. All of a sudden you heard firing then screaming and yelling over the radio. The Germans had anti-tank guns dug into the slag pile". "The German defenders had placed the dreaded 88mm Flak 36 gun in a powerful position. It had armour piercing shells that could penetrate 100mm thick armour at 1,500 metres. It could easily penetrate the frontal armour of a Sherman tank 700 yards before the tanks could accurately fire back. It was such a high velocity gun that its trajectory was almost flat. It just picked off the nearest four Sherman tanks in the open one after the other just like they were in a shooting gallery. My tank just hid behind the nearest house. The commander said ‘Okay just back out of town’. So we did as fast as we could. Half of our E company’s tanks had been destroyed in minutes". The US 3rd Armoured Division’s quick advance into Germany slowed. Fighting along Germany’s western border was proving costly for the Americans. Their Division had started with 400 tanks but enemy resistance had left them with less than 100 that were operational. They still had 650km between them and Berlin. In October 1944 fresh reinforcements arrived and the 3rd Armoured Division began to get ready for a renewed assault. What the Allies did not know was that the fighting at the border had enabled the Germans increase their defences and rush more troops and tanks to that general area. The first major city inside Germany the Allies planned to capture was Aachen. Most of the civilians had been evacuated and this allowed the German army to construct fortified position inside the city and on the approach routes. For the defence of Aachen they had 18,000 troops, 240 artillery guns, and nearly 60 tanks and assault guns. Over 5,000 members of the local militia were called up and used in strong points. They were given orders not to retreat, not even a meter. Those that failed to obey would be shot. This is why the resistance was so fierce. The Americans had assembled over 80,000 troops and more than 300 tanks for their assault. They planned to encircle the city. The 2nd Armoured Division would attack from the north whilst the 3rd Armoured attacked from the south. Shermans from the 3rd Armoured Division’s 33rd Armoured Regiment were ordered to precede directly towards Aachen. They were facing the battle hardened veterans of the 116th Panzer Division. They were very skilled fighters. They had been in battle for years on the Russian Front and now they had been transported westwards to fight on this front. They fought to the last man to keep the allies out of Germany. The terrain south of Aachen provided a defending army many positions from which to ambush an attacking army. The Americans advanced cautiously not knowing when they would meet the enemy tanks and anti-tank guns. The Panzer IV was the most widely used tank in the German arsenal. 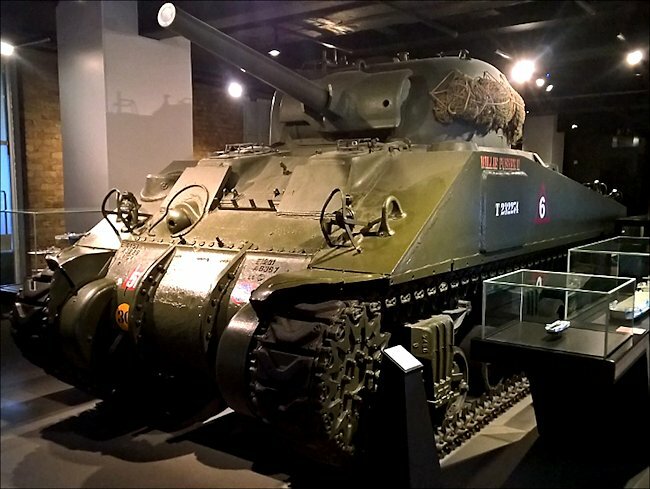 It had a 75mm gun and had 80mm of frontal armour which was stronger than that on the Sherman. Its weakness was its sides and rear which had only 30mm of armour protection. Many had extra skirt armour fitted to the hull and turret to provide some addition strength. Sherman tank crew Cpl. Walter Stitt commented about the Panzer IV, "You were hoping you did not have a battle with one head on. What we were trying to get was side on. If you hit them on the front it was a waste of your ammunition as it just bounced off. You had to get them from the side. The tactic was to get one tank to shoot at the enemy tank from his left. This would cause it to turn to face its opponent so as to have the tank’s frontal armour facing the danger. When he maneuvered a tank on his right then had a clear shot of his right side." "The side shot missed the panzer IV. Our Sherman approached head on. The German tank seized the opportunity. All of a sudden a lieutenant turned up. Lt Bear and told my tank commander that he was going to take over the tank. He had already lost two tanks that day already. When he got into my tank he just stood there a minute. I looked at him. The man was just battle fatigued. Then all of a sudden one of the other sergeants called over the radio and said lieutenant back up they are shooting at your tank. When he said that I turned my periscope around. I then saw a big fire ball go right by me. He then gave the command to the driver to backup. I could see the driver had it in reverse and was gunning the engine." "As soon as the Lieutenant gave the order then bang. A shell hit that went right through the gunner and then the tank commander lieutenant Bear, killing then instantly. The tank driver had gotten out. I dived out of the turret and into the tank driver’s seat. Just as I went out over the side from his hatch, the tank got hit a second time. This time it started to burn and explode. We started with ten tanks but after that battle we ended up with only four". The Americans fought their way into Aachen on the 13th October 1944. The Germens suffered 5,000 casualties trying to defend the city but on the 21st Aachen surrendered to the Americans. It was the first German city to fall to the Allies. Now central Germany laid before the 3rd Armoured Division. Cpl. Walter Stitt said, "The thought kept going through your mind that they would quit now. When they didn’t that came as a surprise".